"41CP12, Burial 16, Pot 5" by Timothy K. Perttula and Robert Z. Selden Jr.
DECORATION: The upper rim panel and rim peaks have S-shaped engraved ovals under the rim peaks, with short curvilinear engraved lines along the upper rim panel itself. The lower rim panel has an engraved scroll and circle motif repeated six times around the vessel; the central circle is centered under the rim peaks and the S-shaped ovals on the upper panel. A white kaolin clay pigment has been rubbed in the engraved lines. Rim sherds from Ripley Engraved, var. 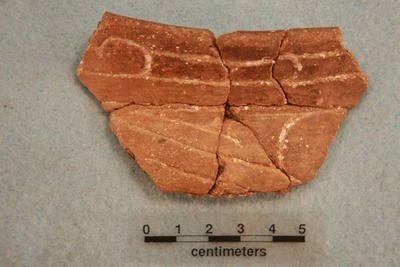 Galt compound bowl, Burial 16, Pot 5, from the Johns site.